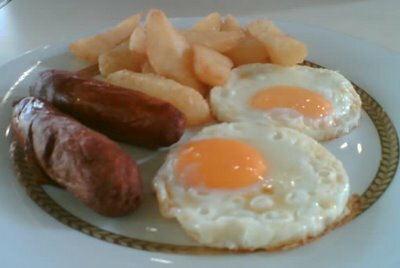 Chips and eggs… and a side of sausage. Where else can one find such homey food but at Colbar. I was here on a Sunday afternoon and it was totally chilled out. Nice, relaxing, tasty. We've been happily visiting Colbar for the past year. In fact, I recall the original Col Bar in the 70's when it was still in Jn Hang Jebat. However, we're just learnt how rude proprietors can really be. We made the mistake of accidently sitting at a table with an obscure "Reserved" sign one sunday afternoon when the place was still emply. An hour or so later the elderly owner, (Mr Lim?) abruply shooed us away, mainly by hand signals. As we were already in the process of leaving, we passed by the cashier/daughter to register our surprise at the off-hand attitude shown us. She was quite nice, presumably having gone to different PR classes than her father. Daddy Rude continued in the same vein. We don't think we shall be rushing back there again. Any suggestions for alternative, but polite, fried egg venues? Rob and Martine. Rob & Martine..... when in Rome, do as the Romans do. Accept the Older Roman culture or leave the country. If i met a grumpy old fool in any country or town i'll forgive the old chap. You already said that the daughter has a different school of thought right? I think if you cannot adapt... go fry your own eggs.